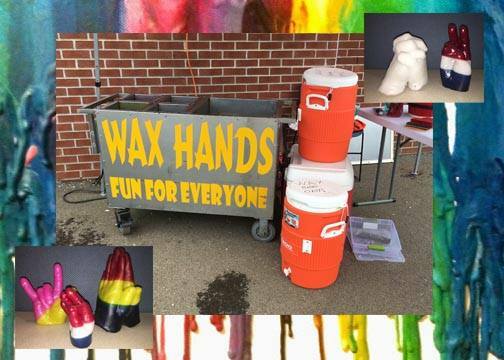 Wax Hands is a fun, interactive, and unique activity to add to your event with the keepsake element that your guests can take home as a keepsake. Keep in mind that we typically get lines of at least 15+ deep waiting for this exciting attraction! You may want to have a line jester to do quick tattoo's we offer them on our website (all they would need is an apron filled with tattoos and a sponge (keep a pail behind wax hands to rejuvenate the sponge to make it wet again after a bit). This line jester should also cut the line off a minimum of 20 minutes priro to event ending to ensure that we are able to get to everyone and noone is disappointed. 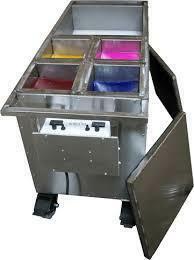 Add an extra attendant to help keep your line moving for events with large groups.